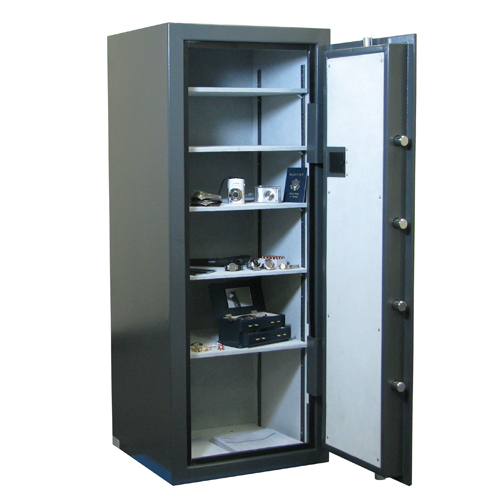 As the largest in Protex's line of fire-resistant burglary safes, the HD-150 offers plenty of room for storing valuables and is intended for residential, home office, or business use. The weight alone (500 pounds) deters burglars, but it can still be bolted right into the floor. A velvet-lined, easily adaptable interior with five removable and adjustable shelves allows storage of a variety of valuables. This is a solid, efficient, and effective safe for just about anyone, and it includes a fire liner rated at 30 minutes fire protection, too. This product ships via private freight carrier from our distributor. Please call or email to confirm shipping charges.